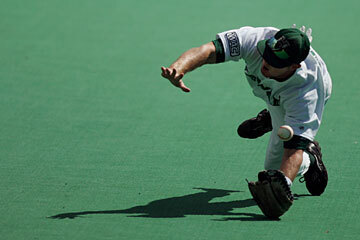 Hawaii right fielder Evan Zimny dove for a fly ball, but didn't make the catch in the first inning against the Alumni. Matt Daly has some of the best stuff on the Hawaii pitching staff. But if the sophomore right-hander doesn't harness it better, he might not make the Rainbows' starting rotation. Daly started and allowed just two hits and one run in three innings yesterday against the Alumni at Les Murakami Stadium. The Rainbows won 13-1 before a gathering of 412. Daly struck out six, but walked four and needed 72 pitches to get through 14 batters. Conversely, Ian Harrington went six innings with 59 pitches, allowing four harmless singles. "I was getting too far behind in counts. A lot of two-strike counts with three balls and I ended up racking my pitch count up pretty quick," Daly said. UH coach Mike Trapasso said Daly doesn't have command problems out of the bullpen, as shown by his 3.25 ERA in 22 appearances as a freshman last year, 20 in relief. "We teach the three-pitch rule with all of our guys," Trapasso said. "You're either on base or you're out in three pitches. When you've got stuff like Matt, it's even more imperative that you stay with that." Toss in the eligibility of Mark Rodrigues still at question, and Trapasso isn't sure what to do with his rotation. A three-game home set against Santa Clara opens the season starting Friday. "We have to go with the mind-set that (Rodrigues is) not going to be available. We may go Harrington, (Nicholas) Rhodes, TBA. If we have to use a Daly out of the bullpen on a Friday game to help us with a couple of innings or on a Saturday game to win a game, we'll do it," Trapasso said. "Then if he hasn't done that, he can start the next game." Tyler Davis, Josh Schneider and Jayson Kramer are among other possibilities for Sunday starter, the coach said. The Alumni had no real middle infielders; Adam Roberts, a corner infielder, played short, and pitchers Clary Carlsen and Justin Costi were at second when not on the mound. The current Rainbows put it away early with a seven-run third, keyed by Jon Hee's three-run, inside-the-park homer that skipped by Matt Inouye in right field. Costi, who went 8-2 for UH last year, absorbed all the damage. "We played pretty good except that third inning," Alumni coach Ron Nomura said. "But can't help it, just didn't have enough guys. Carlsen did a nice job, but he's not used to playing second base." "I thought we were really good defensively, we got some good swings for the most part," Trapasso said. "But we need to be better and our demeanor needs to be tougher." Rawlins out: Senior right-hander Keahi Rawlins remains on the roster, but won't play this year because of personal reasons. "I feel bad for him because it's his last year," Trapasso said. Rawlins appeared in five games last year in relief, posting an 0-1 mark and 9.39 ERA. His career record is 7-8. Rawlins was one of the most promising players to come from the Molokai High School state championship team of 1999. As a freshman, he homered in the state tournament at Murakami Stadium. E--Inouye (2), Carlsen. DP--Hawaii 2. LOB--Alumni 7; Hawaii 10. 2B--Lopez, Asato, Young. HR--Hee. SB--Wilder, Inouye, Ruff. Umpires--Dan Farsworth (plate), Cary Izuka (first), Mike Evans (third).